Blogs, even big blogs, are supposed to be a little different than old media sites. We write faster and update often. The writing is less processed. We break more real news and we don’t hesitate to opine. We tend to get in fights with readers in the comments. And we aim to gain more of those readers, even the annoying ones, organically by attending events, spreading the word on Twitter and Facebook, and generally being part of the community. One thing big blogs don’t do is buy traffic to juice up the Comscore numbers. It’s an unspoken rule. It’s cheating, and it brings in bad traffic that doesn’t stick around or come back for the most part (or so we assume). I know it doesn’t seem like much, but it’s kind of like finding out your favorite baseball player is taking steroids so he can keep playing long after his expiration date. Anyway, the good news is that the traffic is rolling in. 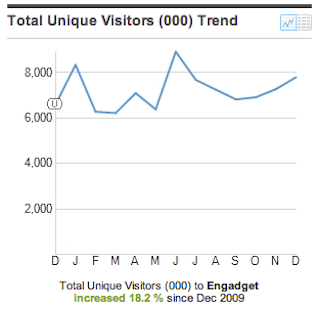 Comscore shows a big dip in Engadget’s unique visitors last summer. But the ad campaign seems to be helping them make up the difference. Which is good, since Engadget’s editors seem to be spending more time trolling TechCrunch comments than doing any actual work. I miss the days when Ryan Block ran that site. Almost immediately after he left the sellout began, and Engadget’s rough but smart edginess vaporized into a plasticized caricature of a real blog. Update: Well, one way to get answers is to publish a blog post. This ad was all TechCrunch. AOL sales didn’t touch this. We won’t do them again. If that policy changes when/if AOL sales takes over, we’ll communicate that.